Arizona’s education system is well-suited to vocational and trade students. Creative planning at the district level ensures career and technical education is accessible to all secondary students, while Arizona’s community college system provides post-secondary vocational and trade educational opportunities across the state. This combination helps prepare students for well-paying, high-demand jobs in fields like education, healthcare and business. Read on to learn more about vocational and trade schools in Arizona and the career opportunities they afford. Students seeking professional training can choose from any number of vocational and trade schools in Arizona. From community colleges to career schools to trade schools, popular programs include nursing engine mechanics and culinary arts. 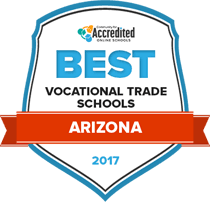 To help choose the right school for you, the following accredited trade and vocational schools in Arizona are ranked based on a variety of factors, including student to teacher ratio, tuition rate and the availability of financial aid. Students at Northland Pioneer College can choose from two different career-preparation programs leading to a Certificate of Proficiency (CP) or a Certificate of Applied Science (CAS). CP programs prepare students to undertake testing and certification from professional organizations in their chosen field. The CAS programs focus on the associate degree coursework in a major field of study, minus the degree’ general education requirements for the degree. The CP requires 32 credit hours in specialties including automotive technology, business, construction technology, education, emergency medical technology, fire science and allied health. CAS programs are offered in paramedicine, welding, mechatronics, industrial operations, education, nursing, cosmetology, and computer information systems. Located in Thatcher, Eastern Arizona College delivers career-oriented students with certificate programs in administration of justice, advanced manufacturing, allied health, business, CADD drafting, cosmetology, information systems and support, graphic design, sports medicine, practical nursing and nurse assisting, and paramedicine. Through its partnership with Gila Institute For Technology (GIFT), Eastern Arizona College offers vocational education for high school students in the fields of automotive technology, cosmetology, nursing assisting and sport medicine. Online courses are delivered through the WebStudy program. With EAC’s open admissions policy, there are no application fees and certificate students can register online. The Career and Technical Education (CTE) program at Mesa Community College offers students online Certificates of Completion in areas in business and industry. Credit requirements are lower than those for associate degrees, and range from 4 to 39 hours depending on the certificate. Certificate fields include administration of justice, architectural CADD, automotive performance, business, information systems, construction technology, early care education, electronics technology, exercise science, fashion, machinist technology, music, nursing and EMT, real estate and welding. Specialist certificates are offered in web design, computer applications: Microsoft Office, emergency management, international trade, retail management, and sustainability. Certificate programs at Arizona Western College are delivered online through two-way interactive television, telecourses, and through multimedia on the Web. More than 60 occupational certificates focus on fields such as accounting, agriculture, heating and air conditioning, automotive maintenance and repair, carpentry, massage therapy, plumbing, construction and occupational safety, culinary arts and dietetics, drafting (CAD), emergency health services, entrepreneurship. Other certification specialties include training in fitness training, food safety, practical nursing, paralegal studies, plumbing technology and welding. Support services at AWC offer career counseling and job-seeking assistance, services for military veterans and transfer-bound students. The college also hosts a firefighter academy. At Estrella Mountain Community College, students can earn undergraduate certificates in major industries and vocations. These 30-credit programs provide career training in administration of justice, culinary studies, child development, computer hardware and applications, customer service management, fire science, hospitality/tourism, mechanical systems, nurse assisting, retails/small business management, and web design. The college’s Career & Transfer Center conducts free employment workshops and assistance with resume preparation, interviewing techniques, and career counseling. Founded in 1992, EMCC is the newest of the ten colleges in the Maricopa County Community College District, serving approximately 15,000 students. Eight new laboratories at EMCC assist the online science, math, engineering, and nursing programs. Chandler-Gilbert Community College allows career/vocational students to focus on the field of their choice while earning a certificate to build their credentials. Their extensive certificates of completion offerings tally more than 632, including studies in aircraft technology, accounting, computer applications, correctional studies, electrical technology, emergency medical technology, forensic science, homeland security, and law enforcement training (academy). The college also offers completion certificates in media and digital arts, Cisco networking, organizational leadership, practical nursing, retail management, social media marketing, sustainability and therapeutic massage. Since 1992, Chandler-Gilbert Community College has been accredited by the Higher Learning Commission. Vocational and trade students in Arizona can gain practical skills and earn industry-recognized credentials through a variety of secondary and post-secondary career education programs. High school students can get the most out of their career and technical education (CTE) through the statewide Joint Technical Education Districts (JTEDs) plan. This plan allows two or more school districts to pool their resources and tools in order to offer more comprehensive vocational education. At the post-secondary level, programs are offered through various vocational and trade schools within the state’s 10 community college districts. Students can use this school search tool to find the vocational and trade schools in Arizona best suited to their goals. An overwhelming majority of Arizonans—close to 90 percent—voted for increased taxes to support Joint Technical Education Districts. In 2015, the Arizona Office of Employment and Population Statistics recorded job growth in nine sectors, including professional and business services, education and health services, leisure and hospitality, and financial activities. In the 2013-2014 school year, 94,269 secondary students and 123,515 post-secondary students were enrolled in Arizona vocational and trade schools. In Mesa public schools, taking two or more CTE classes reduced secondary student dropout rates by 79 percent. Associate degrees are heavily favored by Arizona vocational students, with approximately three times as many students opting for two-year degrees over educational certificates requiring one year or less. However, post-secondary trade students who don’t wish to pursue an associate degree can still earn marketable credentials through Arizona’s community colleges and private technical schools. Secondary students can earn these credentials through high school CTE programs, and may be able to transfer their vocational credits to one of Arizona’s community colleges or apply for dual enrollment. Arizona’s unemployment rate is steadily decreasing, and many vocational careers are expected to see continued growth in the future. The fields of health science, as well as business, management and administration are showing robust growth, with Arizona’s Department of Administration projecting a 30 percent increase between 2012 and 2022. The construction industry is predicted to grow even more, at 31.8 percent by 2022. The fields of health and education services, professional business services and trade, and transportation and utilities are Arizona’s top job providers, and will likely continue to hold their positions through 2022. An aging and growing population in Arizona will help healthcare jobs stay near the top, especially in ambulatory care, nursing, and residential and social assistance settings. In business services, vocational students who enter the administrative or waste services subsectors will see the biggest increase in job opportunities. Job-seekers with some college experience, as well as those with associate degrees, have several career opportunities in Arizona. Take a look at the table below to see which specific careers have the most annual openings and growth. Phoenix offers several educational options for vocational and trade students. At the secondary level, students can pursue vocational and trade programs through their high schools or charter schools, or they can participate in the early high school program sponsored by GateWay Community College. GateWay is one of 10 schools in the Maricopa Community Colleges system, and was the first technical school in Arizona. Three other Maricopa community colleges offer vocational education in Phoenix: Paradise Valley Community College, Phoenix College and South Mountain Community College. The Maricopa Skill Center, a workforce development center, is also located in Phoenix. MSC offers a variety of vocational certificates, most of which can be earned in less than a year. The largest employer in Phoenix is Banner Health, so health science students may have positive local job prospects. Honeywell, an aerospace company, is Phoenix’s second-largest employer, followed by American Express, Wells Fargo and Bank of America, translating to career opportunities for graduates of vocational programs specializing in aviation mechanics, business, and financial support services. In Chandler, secondary students can start on their vocational educations through high school CTE programs. High school students may also apply for dual enrollment at Chandler-Gilbert Community College, the only Maricopa Community College in Chandler. CGCC has a variety of academic departments, including nursing and health sciences, business and computing studies, and aviation and applied technology, each of which has specific programs of study to suit students’ interests and career goals. Intel is Chandler’s largest employer, with the Chandler Unified School district coming next. Wells Fargo, Bank of America and Verizon Wireless round out the city’s largest employers. Vocational students with diplomas or certificates in information technology, computer support services, education, and financial support services can expect good job prospects due to these large employers. A government site dedicated to post-secondary education in Arizona. Provides information on financial aid, planning, and higher education events, as well as other useful resources for parents, students and members of the public. Provides information about Arizona’s employment, including statistics and public records. Comprehensive information source for adult education within Arizona’s school system. Provides information about specific programs, and resources for students already in adult education programs. Offers information about Arizona’s career and technical education system, including curriculum and program information, assessment standards, and information about student organizations and funding. Provides information and resources for Arizona job-seekers. Has material on education programs, reemployment programs, and employment laws. An association supporting and promoting the growth of vocational and trade education in Arizona. Hosts conferences and supplies information about news, events and awards. This fact sheet offers and overview of the state’s CTE programs. This offers an overview of the Arizona’s CTE opportunities.